Welcome to the series final of As the Reels Turn. Click here to play! In this last episode, �Maybe We Should have Lunch? ', the dramatic story of the El Paradiso Casino will come to an end. Who will win? Who will lose? 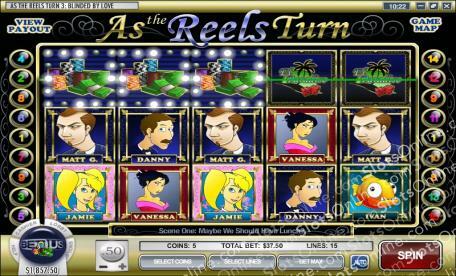 Find out while spinning the reels and bringing in plenty of cash in As the Reels Turn! It's going to be a dramatic end at El Paradiso and nearly every character will play a part. Watch out for Jamie, Mrs Livingston and Danny. Spin three to five of any of these symbols and you'll get up to 200 coins. Matt G, The Don and Vanessa will also be there. Spin three to five of any of these symbols and you'll get up to 65 coins. It wouldn't be the same without the two jackpot symbols: El Paradiso and the money stack. Spin three or more El Paradiso symbols and get up to 1000 times your line bet. Three to five of the money stack will get you up to 1500 times your line bet. Of course Ivan plays a pivotal role in the conclusion of this tale. Three ore more will trigger 10 free spins. There is also the addition of Pampers. This coy kitty is an expanding wild and only appears during free spins. Advance through the scenes with the Advance symbol, but be aware that three or more will also trigger the Danny costumes bonus round. Stay tuned to the end to see what happens to all of your favorite characters and the beloved El Paradiso casino. Ivan the fish acts as a scatter symbol. Spin three or more of him anywhere on the board to trigger 10 free spins. The Advance icon also acts as a scatter. Three or more will not only advance your story and allow you to influence the outcome through your selections, but will trigger the Danny Costumes bonus round. Pampers the cat acts as an expanding wild symbol. He only appears during free spins, but will expand across the entire reel (s) that he appears on. He will triple your winnings unless you spin two Pampers in which case he will multiply your wins by 4. Spin three or more Advance to the Next Scene symbols to trigger the Danny Costumes bonus round. During this game you will have to find an outfit for Danny for his big date with Jamie. Depending on how well she likes his outfit is how many bonus coins you win.